With one game left in the season, the Pitt men’s basketball team is sitting at .500 and tied for 13th place in the conference after another loss Tuesday night. After the Panthers (15-15 overall, 4-13 ACC) won three of four games over a 10-day stretch in mid-February, the team has slipped, losing its third straight contest on Tuesday night to the Georgia Tech Yellow Jackets, 61-52. Senior forward Michael Young put on a strong performance for the Panthers, tallying 16 points on four rebounds. 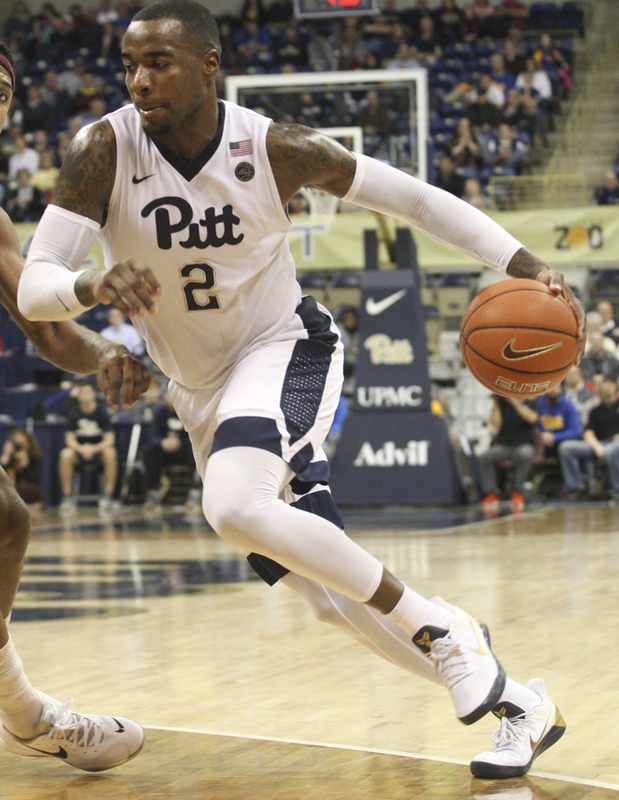 But Pitt’s lack of an inside presence showed again, as the team failed to contain Georgia Tech center Ben Lammers, who led the game in scoring with 20 points on 8-13 shooting. On top early, the Yellow Jackets took a 9-2 lead after 3-pointers by Quinton Stephens and Josh Heath. The Panthers offense struggled, making just two of their first seven shots. Pitt closed the gap over the next couple of minutes, tying the game at 15 apiece on a 3-pointer by redshirt senior guard Chris Jones with 11:48 to go in the half. After a Georgia Tech timeout, Pitt coach Kevin Stallings subbed out all his starters. Among the substitutes taking the floor was forward Ryan Luther, who saw his first action in 12 games due to a foot injury he suffered on Jan. 13. Play was even for the next few minutes as both offenses struggled to score. At the third media timeout, the Yellow Jackets held a one-point lead, 20-19. With 6:14 to go, Pitt took its first lead since 2-0 on a 3-pointer by senior forward Sheldon Jeter. The Panthers extended their advantage in the ensuing sequence, going on a 13-2 run to take a 28-22 lead with 3:14 left in the half. A layup by Georgia Tech’s Tadric Jackson was the only made basket for the rest of the half, and the Panthers led 28-25 at the break. The opening 20 minutes were even, as the Panthers went 11-30 from the field while Georgia Tech went 10-30. Rebounding was almost identical with Pitt grabbing a 20-19 advantage. Jamel Artis, Cam Johnson and Jeter led the half in scoring with seven points each, while the Yellow Jackets’ scoring was evenly distributed with four players tallying five points each. Georgia Tech quickly erased the Panthers lead in the second half, tying the game at 31 on a layup by Lammers with 16:17 left. The Yellow Jackets took the lead moments later on a pair of Lammers’ free throws. After both offenses failed to score for over two minutes, Tech’s Justin Moore made a layup with 11:57 to go, extending his team’s lead to 37-33. The Yellow Jackets went up seven at the midway point of the half, but the Panthers responded, going on a 6-0 run with 3-pointers by Johnson and Young to make it 40-39. The Panthers retook the lead shortly after on a 3-point play by Young, but Georgia Tech took it right back on a jump shot by Lammers with 5:41 left. Tech maintained the lead for the next couple of minutes, taking a 53-50 lead at the final media timeout with 3:35 on the clock. Georgia Tech dominated the Panthers down the stretch, closing the game by making seven straight shots and winning 61-52. With yet another loss, Pitt drifts further toward the bottom of the ACC standings. The team is now tied for 13th place in the conference with North Carolina State. Pitt wraps up its regular season on Saturday with a game against Virginia at noon with the opportunity to finish the regular season above .500. The team will then play on Tuesday in the opening round of the ACC Tournament in Brooklyn, New York, against an undetermined opponent. Editor’s Note: A previous version of this story incorrectly stated Pitt was in last place in the ACC. The Panthers are tied for 13th place out of 15 teams.